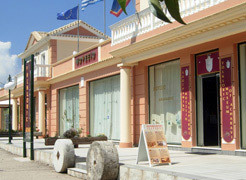 The most important museums of the island are placed in the old town (there is a proper section dedicated to the museums of this area), in the new part of Corfu city or in villages not far from the chief town that is the cultural center of the island. Inside the Paleopoli, in the middle of the gardens, there is the Mon Repos palace which was built in 1924 by High Commissioner Frederick Adam and became later property of the Greek royal family. Today it is a Museum that collects the various archaeological finds of this area, Byzantine relics, furnishings and garments of the British hegemony age. The finds date back to the period between 1936 and 1955 when also a Christian basilica and some sections of the ancient Agora have been discovered. Open everyday from 8:30 to 15:00. Monday closed. Tel: 0030 26610 30680. The Achilleion palace is famous mainly because it was the dwelling of the Princess Sissi and is situated ten kilometers to south of the city, in a village called Gastouri. The history of this palace is mostly tied to three important persons: Elizabeth (Sissi) the Queen of Austrian-Hungarian empire, Guglielmo II Emperor of Germany and the Baron Von Richthofen. Elizabeth, during one of her trips, stopped over in Corfu and fell in love with the island so much that in 1889 she decided to buy a villa with a incredible view all over the city and part of the island. The villa was demolished and the current building was built by the Italian architect Raffaele Carito in two years and then was furnished personally by the Queen. For her love of Greek culture, Sissi wanted to pay homage to it dedicating the palace to Achilles and for this reason called it "Achilleion". In honour of Achilles she had a statue, sculpted by E. Gustav Herter in 1884, placed in the middle of the garden, representing the dying Achilles at the moment of removing the arrow from his heel. After the murder of Sissi the villa remained uninhabited until 1907, when it was bought by Guglielmo II. He changed many things in the garden and in the structure and he moved the statue of the dying Achilles in order to put a more victorious version of Achilles, a statue in bronze created by J. Gotz that well represents the spirit of Germany in that age. After death of Guglielmo the palace was abandoned and during the two world wars it was used like hospital and headquarters, while after the wars it was used like seat of schools and asylums. Left in a state of neglect, it got ruined and lost its characteristic splendor, for this reason the Greek government in 1962 decided to rent it for twenty years to a German company owned by the baron Von Richthofen. Von Richthofen decided to renovate the palace in order to open inside it a casino and a museum to collect the art works that had been sold or lost over the years. When in 1982 the palace came back in the hands of the government the casino was moved inside an hotel in the center of the city and the museum, today still opened, remained in the palace. In 1994 the Achilleion was seat of the Summit Conference of the members of European Union. Visiting the grounds today, you are struck by the garden and the inner rooms as well as by the overall elegance of the palace. bas-reliefs and balconies with statues representing the Greek mythology. Entering in the hall you will see immediately the great perron, with the banister in bronze, that brings to the upper floors, but closed to the visitors. At the end of the perron there is a big oil painting, created by F. Matsch, dedicated to Achilles dragging the body of Hector after his death. You can visit the rooms, still furnished with the old furnitures chosen by Sissi and Guglielmo II, where there are documents regarding these two important figures and objects belonged to them like photographies, pictures, jewels, the saddle used by the emperor of Germany and the miniature of his yacht. A catholic chapel sought by Elizabeth is included in the building and inside it there are a picture of the Madonna painted by Matsch with to sides a statue of Christ and one of the Madonna and the original altar with the prayer book and the vestments that Pope Pio IX gave to Elizabeth. The garden full of plants and flowers is fantastic and there is also a portico with many statues in marble and bronze, copies of the original ancient statues and of modern creations. The statues represent divinity, muses and philosophers. From the garden, the view over the surrounding area and the city is wonderful so that it's easy to understand the choice of this vantage place. Open 9am-6pm daily. Telephone: 0030 26610 56245. This small museum is situated in Sinarades, more or less 10 km to the south-west of the city of Corfu, and has been opened in 1982. Its site is inside a typical construction of the village and it was born thanks to the collaboration of the Historical Society of Corfù which contributed to the reconstruction of a peasant house of the XIX century. On the first floor of the building there is this reconstruction with a living room, a kitchen and a bedroom furnished with tools and furniture of that time. Another part of the museum, on the second floor, is dedicated to the objects of daily life like tools, musical instruments, pieces of pottery, garments and tools for farming and fishing. Always on this floor there is an office with various books and a collection of old documents that were donated to the museum. Open everyday from 9:30 to 14:00. Monday closed. Tel: 0030 26610 54962. During its long history, Corfu has been inhabited by people of various civilizations. The lasting remains of all these different cultures have blended beautifully in the long run and have shaped over the centuries the famous Corfiot tradition and the special identity of our local civilization. The Italian temperament, our folk music, the uses and customs, the feasts and local costumes are all part of this unique cultural heritage and it is the aim of this newly founded institution to preserve and promote it. Historical mementos, photographs, drawings and historical texts have been meticulously collected and are now exhibited with much love and care in the Folklore Museum of Acharavi, opening a whole universe of personal stories and collective experience to enable us the better to link the past to the present time. These objects reflect the civilization of which they are the fruit and lead us to a trip in time with the scent of the last three centuries of Corfiot history. The Folklore Museum of Acharavi was inaugurated in October 2008 in a building of more than 1,000 square metres. The owner and visionary creator, Mr Spyros Vlachos, has been collecting, maintaining and promoting with endless care, joy and attention local folk objects of particular historical interest for the last 25 years. The permanent exhibition of the museum is located in two rooms. The objects, which have been mainly donated, are organized in zones concerning the main local activities. - Traditional olive press, shoe-maker’s and carpenter’s workshops, wine and distilled alcohol producing devices, a traditional kitchen space, a traditional bedroom, a religious space and much more. Beyond the permanent exhibition area of the Museum, there is also a Conference room equipped with state-of-the art audiovisual devices especially designed for educational and cultural projects, lectures and temporary exhibitions. There is also a traditional coffee house as well as a permanent exhibition of traditional products and woven and embroidered handicrafts.